The ark of the covenant has inspired a lot of curiosity over the years. The ark was a holy chest that God instructed the Israelites to build. It represented the throne of God. In the past, it has been the subject of documentaries and movies like Raiders of the Lost Ark. Few people are talking about that artifact today. Yet a fascinating verse in the Bible says that in this modern era, many people will be talking about it. The implication is that very soon, the ark of the covenant is going to be found! That verse is found in Jeremiah, a book of prophecy that was written for this end time (Jeremiah 30:1-9). So this prophecy about the ark is for us today. If the ark were found, it would electrify many people around the world! People don’t know where the ark is, but I believe that the Bible—and a certain nation’s history—tell us in which country it is located today. This prophecy about the ark of the covenant is found in Jeremiah 3. To understand it, we need to look at the context. God addresses this passage to “backsliding Israel,” to whom He says, “I am married unto you.” Numerous English-speaking nations have descended from ancient Israel, but this is not talking about those nations. God is only married to His Church, which is spiritual Israel. In this prophecy, God is talking specifically to His Church, which is His wife (Revelation 19:7). Jeremiah is talking about a modern crisis in God’s Church. God’s end-time Church is rebelling against Him and backsliding from its Husband! But God does have a faithful remnant that delivers this message (Revelation 3). Jeremiah 3:16-17 move forward in time: “And it shall come to pass, when ye be multiplied and increased in the land, in those days, saith the Lord, they shall say no more,The ark of the covenant of the Lord: neither shall it come to mind: neither shall they remember it; neither shall they visit it; neither shall that be done any more. At that time they shall call Jerusalem the throne of the Lord; and all the nations shall be gathered unto it, to the name of the Lord, to Jerusalem: neither shall they walk any more after the imagination of their evil heart.” These verses refer to the time of the World Tomorrow, after Jesus Christ has returned and is ruling the world. Notice: Once that occurs, people will no longer focus on that physical ark. This implies that they were focusing on it before that time. In ancient Israel, the ark symbolized God’s presence. Located in the holy of holies inside the tabernacle, it was a symbol of God’s throne and rule. He even spoke from that ark (e.g. Exodus 25:22). So it makes sense that once God’s reign is actually established on Earth, that physical ark will no longer “come to mind.” The world will no longer need a symbol for God because He Himself will be here. But right now, almost no one is talking about the ark of the covenant anyway. Notice that shocking statement: God says people won’t visit the ark anymore! Do you know any place today where people visit the ark? There isn’t any such place, but God here describes a time when people will visit the ark of the covenant. Remember, the time frame is during a backsliding of God’s Church, leading into the Tribulation and the Second Coming of Christ. These scriptures refer to the time we are living in now. Just before the Tribulation, many people will be visiting the ark like a tourist attraction, according to this prophecy. It sounds like it has created a world sensation! I don’t see how you can understand this prophecy any other way. Strong’s Concordance defines visit: “to visit, to inspect, to review.” A secondary definition is “an overseer, to be set over.” That certainly indicates to me that the ark is going to be found. The ark is rarely discussed today. You may see an occasional documentary about people looking for it, but they have never found it. That is because it has not been time for the ark to be found! But this prophecy indicates that it will be found in this end time just before the Great Tribulation. That is very soon. Jesus Christ said we must live by every word that proceeds out of the mouth of God (Matthew 4:4). That includes the book of Jeremiah. Do you have the faith to believe every word of God? The biblical book of Chronicles contains a lot of prophecy for this end time. My booklet The Book of Chronicles explains why (request your free copy). Chapters 13-17 of 1 Chronicles are five key prophetic chapters, and they discuss the ark of the covenant extensively. Why should the Bible speak so much about the ark of God? Because of what it symbolized. In the Old Testament, the ark was everything. It is called in various places “the ark of God,” “the ark of the Eternal,” “the ark of the God of Israel,” “the ark of the Lord of all the Earth.” Everyone in Israel looked to it. It was a type of the throne of God—very much like a blueprint of God’s throne room in heaven. It was the symbol of God! 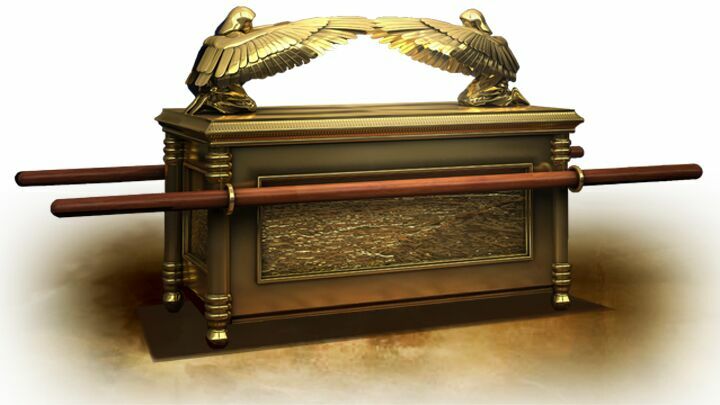 1 Chronicles 13:6 talks about God dwelling “between the cherubims.” Most Bible dictionaries have a picture of the ark of the covenant, showing those cherubim with their outspread wings covering the throne of God. That depicts how God’s actual throne looks in heaven. 1 Chronicles 15 describes the ark’s return to Jerusalem after the Philistines had taken it captive so many years before. The Israelites really lamented when they lost it because the glory of God had departed from them. But as they brought it into the city, they celebrated with trumpets and coronets, cymbals and dancing. David wore a robe of linen, and all the singers wore linen, a symbol of righteousness (Revelation 19:8). 1 Chronicles 16:37 describes Asaph and his brothers ministering “before the ark continually, as every day’s work required.” Christians today are likewise expected to labor before God daily. 2 Corinthians 4:16 says the inner man is renewed day by day. Every day we must renew that inner man on our knees in prayer, and by studying our Bibles. 1 Chronicles 17:4 contains a very interesting statement. God sends a message to David saying, “Thou shalt not build me an house to dwell in.” He is talking about the temple, which would house the ark. God determined that Solomon would build that temple, not David. But here He refers to the ark as “me”! In verse 5, He says, “For I have not dwelt in an house since the day that I brought up Israel unto this day; but have gone from tent to tent ….” Again, God is talking about the ark and saying,I dwell there, because the ark is there. Imagine what a spectacular event it would be for the ark that symbolizes God Himself to be discovered today! But where is it? Nobody today really knows. However, I want to show you how the Bible and Irish history reveal whatnation it is in. To understand this, we first need to look at some important history. The ancient nation of Judah fell to the Babylonians in 585 b.c. In the siege, the king of Babylon killed all the sons of Judah’s King Zedekiah. Most people believe that the royal line of King David ended at that point. But if you study 2 Samuel 7:12-16, you see that God had promised to establish David’s lineage on that throne forever! If David never had another royal descendant—if the throne of David ceased with Zedekiah—then God’s promise would have been broken. However, as Herbert W. Armstrong proved in his book The United States and Britain in Prophecy, that throne did not cease. God kept His promise by keeping a royal descendant of David—not a son of Zedekiah but a daughter—alive. He preserved her with the help of the Prophet Jeremiah, whom God allowed to escape Babylonian captivity. As Mr. Armstrong proved in his book, this royal line was thus preserved in the British Isles. It can be traced directly to the British throne today! Queen Victoria died in 1901, so this is fairly recent history. She recognized that she was a descendant of King David of ancient Israel—that her sitting on the throne of England was actually a fulfillment of God’s promise to King David! Queen Victoria ruled more than 60 years on that throne of David, the same throne that sits in London today. She knew about all the history of her throne. These days, we don’t hear much about that history from Britain’s throne, but we should. It brings the Bible to life in a deeply inspiring way. Irish annals show that when Jeremiah migrated to Ireland, he brought with him more than just the princess of Judah who carried on David’s throne. “Besides the royal family, Jeremiah brought with them some remarkable things,” Mr. Armstrong continued, “including a harp, an ark, and a wonderful stone called ‘lia-fail,’ or ‘stone of destiny’” (op. cit., emphasis mine). The “stone of destiny” is also called “Jacob’s pillar stone.” It is the stone the patriarch Jacob set up to memorialize the promise God made to him in Genesis 28—that his descendants would become as numerous as “the dust of the earth.” This stone remained with the nation of Israel throughout its history. And when Jeremiah fled Jerusalem, he took this stone with him. We know where this stone is today: It is in Scotland, in Edinburgh Castle. In recent years, faithless critics have tried to discredit the origins of this stone—but for hundreds of years its true origins were widely accepted and understood. Queen Elizabeth was crowned over it, as was Tea-Tephi’s royal son anciently. Notice that along with that stone, Jeremiah brought the ark of the covenant on his journey to Ireland! This knowledge, too, was not uncommon until relatively recently. F. R. A. Glover, who ascertained that the British monarchy was aware of its linkage to King David, wrote extensively about these objects having made their way to Ireland with Jeremiah. His book England the Remnant of Judah and the Israel of Ephraim records this history. Glover stated that the grave of Queen Tea-Tephi lies in the Hill of Tara, the origin of Irish history. In his research, he found that she had been buried with the two stone tablets of the Ten Commandments, along with the ark of the covenant. Note that! Tara comes from torah—God’s law! There is a well-known connection between the famous Tara Hill and the law of God! This is amazing history. The tablets of the Ten Commandments were written by the very finger of God! (Exodus 31:18; 34:1, 28). God personally gave them to Moses, and they were placed within the ark of the covenant (Deuteronomy 10:5; 1 Kings 8:9; Hebrews 9:4). According to these archaeologists and historians, these tablets were buried with Tea-Tephi in Tara Hill! Why don’t we hear more about this history? It is clearly recorded in Ireland’s history books. This simply cannot be chalked up as a “legend” or “myth” of Irish history! Don’t you think it might galvanize a lot of people if the ark were found, and the Ten Commandments on those two tables of stone were inside? Why would God cause the ark to be found in this end time—and never before? Why would He want people to visit the ark now—and not before or long after? He could be using this symbol as a warning sign that we have strayed far from the true God—and are about to experience dire consequences. Prophecy shows that God is going to do some dramatic things to warn this world of the Great Tribulation and Day of the Lord just before His Second Coming. The period leading up to Christ’s return is going to be the worst suffering in human history. That is the horrifying end result of mankind’s vile sins! God wants to warn people in advance to help as many as possible to repent before that time comes so they don’t have to experience it. If the ark were discovered, wouldn’t that be a powerful witness to the world? I believe it would be. Proof that the biblical chronicle is accurate could help lead some to repentance. The ark’s discovery would even point people to where God’s message was being proclaimed, and help them to realize that even though they heard it and didn’t act on it, that message was right and was from God. Prophecy shows that many people—an innumerable multitude—are going to repent during the Great Tribulation and will receive God’s protection at that time (e.g. Revelation 7:9, 14). Perhaps the discovery of the ark of the covenant will contribute to the size of that number. Remember the prophecy in Jeremiah 3:16, because God tells us that the ark is going to be found! And Scripture and Irish history even tell us, in general, where it will emerge!